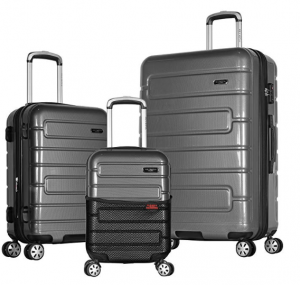 Olympia Nema (HE-8000) is an imported, expandable, hardshell luggage set of three pieces of 18, 22 and 29-inch suitcases with the TSA locks. You can purchase them in black, rose gold, teal, silver or purple colors and there are significant price differences at the time of this review, which you may want to check out at Amazon.com. 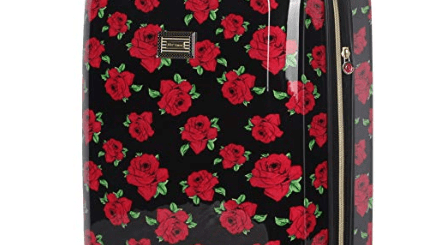 This is an imported set of three suitcases that are stocked in US and shipped quickly via Amazon.com within a few days. The packaging will show what’s inside and you may want to select the “Ship in Amazon packaging” option to hide the bags. These are durable, sturdy and lightweight bags built with the two-tone strong PC material (polycarbonate) and fabric lining. The integrated lock on each suitcase is three-dial combo system that is TSA-compatible. And only the TSA staff at the airport terminal will get into your bag without needing to damage the lock. They have the eight jumbo size double spinner wheels that make as little noise as possible while gliding very smoothly in all directions- 360 degrees. You can move them effortlessly by holding the aluminum telescoping handle with an ergonomic design and that locks at different points. Inside you shall find a buckle tie-belt to keep your clothes in place (with a different design to cross straps commonly found in most suitcases), a divider with zip mesh pocket and a removable transparent 3-1-1 vinyl wet zip pouch for your toiletries or other small items. The larger two (22” and 29”) suitcases are expandable and you’ll find a hidden compartment inside the 22” carry-on bag. There is a utility hook for you to hang your small bags or other items and the interior shoe pockets in the 30” suitcase. You’ll also find a grip handle at the bottom to be able to lift the bag easily. The smallest 18” bag is suitable as a carry-on bag in all airlines domestically or globally, weighs 5 pounds and measures 18 x 12 x 8 inches. 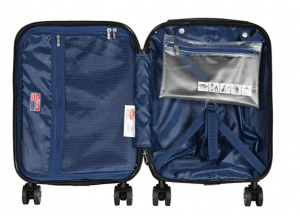 The medium size 22” bag is also good as a carry-on in many airlines and you may need to check in prior to your flight on some airlines, weighs 7 pounds, with the dimensions of 22 x 14 x 12 inches. The largest 29” suitcase weighs 10 pounds and measures 29 x 19 x 13 inches and you can fit in quite a lot of your stuff, making it suitable for your longer trips for leisure or business. This high-end set of three bags is not very cheap but you’re certainly getting what you’re paying for.